Ashkelon (also Ashqelon and Ascalon) (Ebreu: אַשְׁקְלוֹן‬ (audio) (help·info); Arabic: عسقلان (ˁAsqalān)‎; Laitin: Ascalonia; Akkadian: Isqalluna) is a coastal ceety in the Sooth Destrict o Israel on the Mediterranean coast, 50 kilometres (31 mi) sooth o Tel Aviv, an 13 kilometres (8.1 mi) north o the border wi the Gaza Strip. The auncient seaport o Ashkelon dates back tae the Neolithic Age. In the course o its history, it haes been ruled bi the Canaanites, the Philistines, the Israelites, the Assiries, the Babylonians, the Greeks, the Phoenicians, the Romans, the Persians, the Egyptians an the Crusaders, till it wis destroyed bi the Mamluks in 1270. The Arab veelage o al-Majdal (Arabic: المجدل‎, Ebreu: אל-מג'דל, מגדל‎‎), wis established nearbi in the 16t century, unner Ottoman rule. 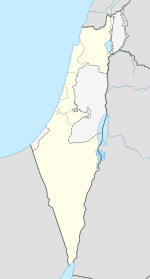 In 1918, Ashkelon became pairt o the Breetish Mandate for Palestine. In the 1948 Arab–Israeli War, Majdal wis the forward position o the Egyptian Expeditionary Force based in Gaza. The veelage wis occupee'd bi Israeli forces on November 5, 1948, bi which time maist o the Arab population o 11,000 haed been forced tae leave. In 2015 the population o Ashkelon wis 130,660. ↑ "''Eretz'' magazine, archaeological sites in Israel". Eretz.com. 1948-11-05. Retrieved 2011-08-10. ↑ "Association of twinnings and international relations of Aix-en-Provence". Aix-jumelages.com. Retrieved 2011-08-10. Wikimedia Commons haes media relatit tae Ashkelon. This page wis last eeditit on 21 Apryle 2017, at 18:24.